This lecture is devoted towards the explanation of Pelvic Girdle. Section one strives to talk about the Structure and Bony Landmarks. In the beginning, the educator has shed light on the Structure of the Pelvic Girdle. Then he moves on to elucidate the individual parts of the girdle which encompasses The Sacrum, Bony landmarks of the Sacrum, The Coccyx and the Innominate Bone, respectively. Subsequently, the educator has described the Ilium, Ischium and Pubis, comprehensively. In the end, the educator concluded by mentioning about the Other Bony Landmarks. 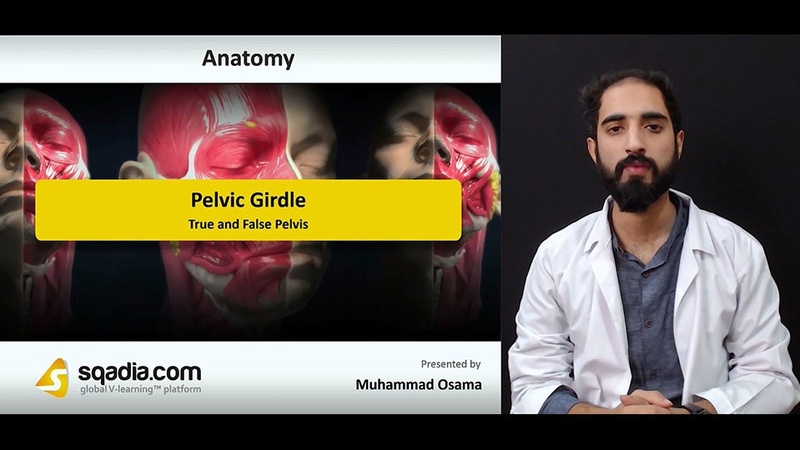 The key focus of section two is on the True and False Pelvis. The educator started off by delineating the Function of the Pelvic Girdle. This is succeeded by a conversation on the Pelvic Inlet and the Pelvic Outlet. Next in line, the educator has reported the False Pelvis and True Pelvis. Conclusively, the educator has wrapped up by a comprehensive dialogue on the difference between The Male & Female Pelvis. Section three elaborates the Sacroiliac Joint. Firstly, the educator has defined the Sacro-iliac Joint, meticulously. Secondly, Ligaments of the SI joint have been brought into consideration. These ligaments include Anterior Sacroiliac Ligament, Inter-Osseous Sacroiliac Ligament, Posterior Sacroiliac Ligament, Sacrotuberous Ligament and the Sacrospinous Ligament, correspondingly. Furthermore, SI Joint Motion – Nutation and SI Joint Motion – Counternutation has also been stated. In the end, the educator has summed up by highlighting the Significance of SI Joint Motion During Child Birth. Section four accommodates the Symphysis Pubis and Lumbosacral Joint. The educator commenced by explicating what the Pubic Symphysis Joint is. Alongside this, Ligaments of the Pubic Symphysis have been taken an account of. These are comprised of Superior Pubic Ligament and the Inferior Pubic Ligament. In addition to this, Lumbosacral Joint has been described as well. Following this, Iliolumbar Ligament and Lumbosacral Ligament has been reflected upon. In the end, the educator has drawn attention towards Lumbosacral Angle and the Lumbosacral Ligament. The major emphasis of section five is on the Motions. The educator has radically talked about the Pelvic Movement in the Sagittal Plane later on followed by a discussion on the Force coupling in the Sagittal Plane. Afterwards, the educator moves forward to voice about the Pelvic Movement in the Frontal Plane. Along with this, Lateral Pelvic Tilting and Other Joints Movements Affected by Frontal Plane Movement has also been expounded, comprehensively. This segment is winded up by an illustration of the Force Coupling in the Frontal Plane and Pelvic Movement in the Horizontal Plane.